Here is a list of some Asa ki Vaar recordings that I like. Also notice our blog post related to this topic: Asa KI Vaar or Asa DI Vaar? For the classical music enthusiast, its worth noting that several morning Raags are used in Asa ki Vaar; I have yet to hear an Asa ki Vaar sung entirely in Raag Asa. For example the following is just the beginning of Asa ki Vaar -- a polished recording, but the flute starts with Asa Maand not Asa (thats a usual problem when you ask an Indian classical musician to play Asa, they do Asa Maand). Notice how Asa transitions into Bilawal in the middle. 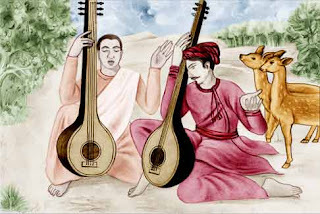 What is the difference between Raag Asa and Raag Asa Maand ?